Working Women’s Congress of WFTU held in Panama | Fight Back! Panama City, Panama - The World Working Women’s Congress of the World Federation of Trade Unions was held in Panama City March 8 through 10. 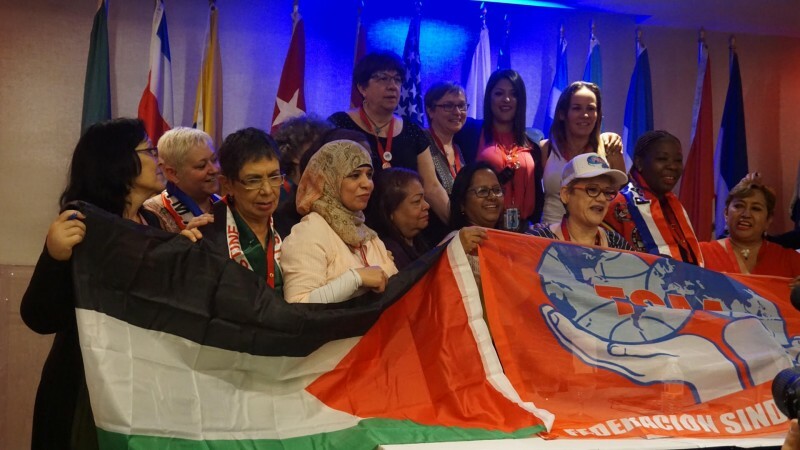 Militant women trade union leaders from around the world gathered under the slogan, "We fight for equal rights at work, in society and in life." The World Federation of Trade Unions (WFTU) is an international union federation with more than 92 million members that is based on class struggle unionism, union democracy, internationalism and anti-imperialism. The third World Working Women’s Congress was hosted by the National Coordinator of Panamanian Workers (CNTP). Delegates from Latin America, the Caribbean, Africa, Asia, Europe and the U.S. attended. The congress included presentations by union leaders from many countries in the Americas and around the world about the struggles faced by women workers in their countries, including the fight to improve working conditions and wages, equal pay for equal work, for maternity and family leave expansion, and for an end to sexual harassment and assault. The Panamanian Labor Minister hosted the delegates at a special screening with the director of an award-winning documentary about the life of the great Panamanian woman militant Marta Matamoros, WFTU vice president, who dedicated her life in the struggle for the rights of the working women. The congress delegates voted to pass a general declaration and action plan and elected new leadership until the next congress. The action plan includes coordinated mobilizations for International Working Women's Day (March 8) and other key dates each year; to advocate for UN ratification of resolutions regarding women's unpaid work, the rights of migrant women workers, education of girl children, and women's reproductive health. The congress also called for the creation of an Asian Union of Textile and Garment workers, and for the strengthening of regional and sectoral educational programs for women. Grace Khanye Mathelepo of the National Union of Mineworkers of South Arica was elected chair of the WFTU Working Women's Committee. She is joined on the new leadership body by union leaders from Brazil, Colombia, Costa Rica, Cuba, Panama, Peru, U.S., India, Australia, Senegal, Palestine, Austria, France, Greece and Spain.